If your home has an under-floor crawl space, there are some important reasons for you to make an occasional inspection of this often-ignored area of your home. You could discover some easy ways to both increase your home’s efficiency and improve your health. Moisture. Does your crawl space smell musty? If so, this is the smell of mold and mildew. It’s normal to have a small amount of mold and mildew in your home, but extensive colonies can cause allergies in some people. Moisture reduction is the best way to control these bio-contaminants anywhere in your house, and one of the best ways to dry your crawl space is by installing a plastic ground moisture barrier over any open dirt. Be sure it is at least 6 mils in thickness, that it seals snugly up to the foundation, and that any seams are overlapped or taped tight. Duct work. Do you have leaky or un-insulated ducts? Your duct system should be airtight, since duct leaks can draw crawl space air into your home, waste energy, and degrade your indoor air quality. Seal all the joints in your ducts with metal duct tape or duct mastic. Avoid common gray fabric “duct tape” since it tends to come loose. Insulation. Is your crawl space un-insulated? If so, and you live in a cold climate, you could be losing a lot of heat in the winter. 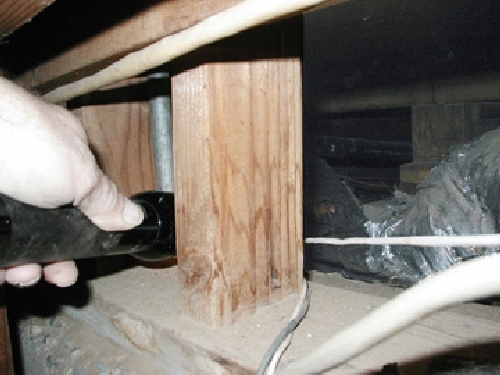 Your crawl space insulation can be installed at either the foundation wall or under the floor. Contact an insulation contractor to learn which option is best for you.